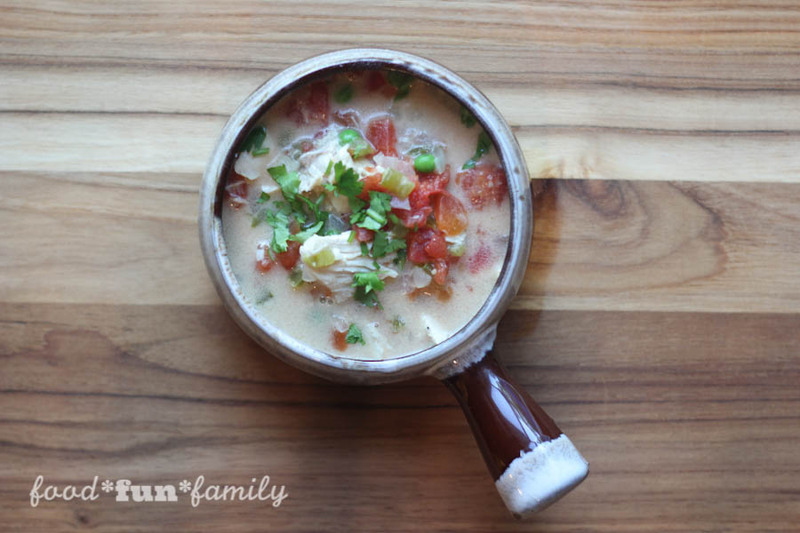 This Brazilian chicken soup with rice is one of our family’s favorite soup recipes ever. Note: Amazon affiliate links are used in this post to show the tools I use to make this tasty soup! I discovered the recipe back in 2009 when I was sent a rice multi-cooker. We still use ours several times a week and LOVE to death BUT it is not available anymore – this one is similar. If mine ever dies on me, I will be replacing it immediately! 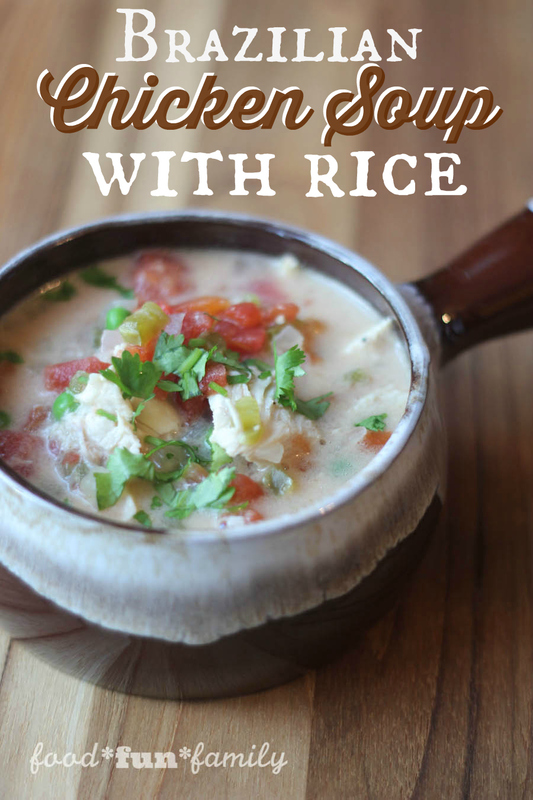 Enough about the rice cooker and back to this delicious chicken soup with rice recipe. I have changed the recipe just slightly since the first time we made it (by leaving out the shrimp and frequently cooking it in the crock pot versus a Dutch oven), but I can’t recommend it enough. Please note that although the rice is a very important part of the soup, it is cooked and stored separately from the soup and only added to the soup bowl when ready to eat. Note: in all honesty, I have no idea if this recipe is really like anything that would be served in Brazil (I’d love to know!) but regardless of what it’s called, it’s simply good soup! And right now is definitely soup weather! Dish me up a bowl! Place the chicken in a medium mixing bowl and season lightly with salt and pepper. Sprinkle 2 tablespoons of the lime juice and rub chicken with minced garlic. Mix thoroughly and refrigerate for 15 minutes. Heat olive oil in a large Dutch Oven. Add onion and pepper and sauté for about 4 minutes, until soft and fragrant. Stir in the canned tomatoes with juice, peanuts, jalapeno, bay leaves, salt, pepper, broth, and coconut milk. (Note: be sure to stir or shake the coconut milk prior to pouring from can). Add the chicken with marinade and stir until well combined. Heat to boiling and then reduce heat to simmer. Cover and simmer for at least an hour, or until chicken is cooked through (if chicken is very thick, you may want to cute into smaller chunks). While soup is heating, prepare rice. About 10-15 minutes before serving, remove the chicken and cut or shred into bite-sized pieces and return to pot. Add frozen peas and additional 1 tablespoon of lime juice. Replace lid and heat for an additional 10-15 minutes. To serve, place some warm cooked rice (approximately ⅓ to ½ cup depending on portion size) in the bottom of each soup bowl and ladle the soup on top. If desired, sprinkle with chopped cilantro and/or chopped peanuts. Instead of simmering on the stove, I like to throw everything in the crock pot after sauteeing the onions and peppers and cook on low for 5 hours or so. 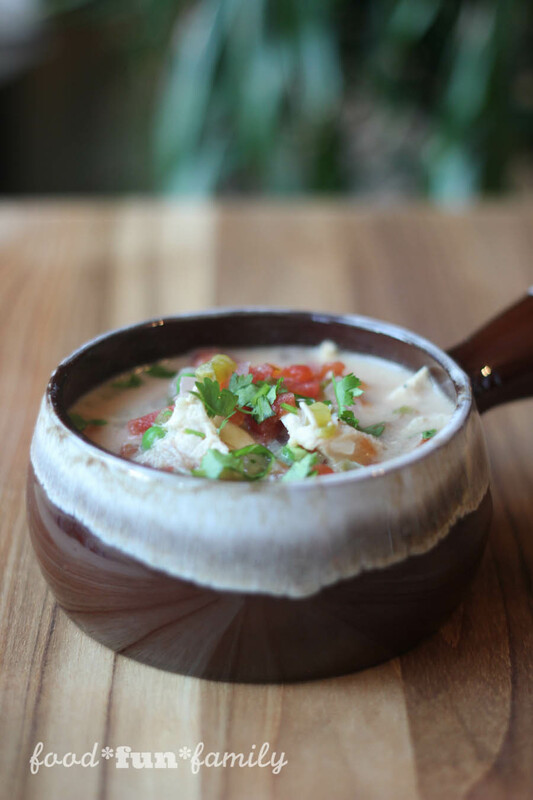 This soup looks amazing and I can see why it is a favorite among favs! I’d love to try this, it sounds exotic but I can get all these ingredients, not too expensive, either – nice! This soup looks divine! Thanks for sharing your recipe with us at Merry Monday. That looks delicious and sounds perfect during all of this cold weather. I pinned it to try soon!